On the second night of my sister's bachelorette weekend, we rented a limo and went out on the town for the evening. 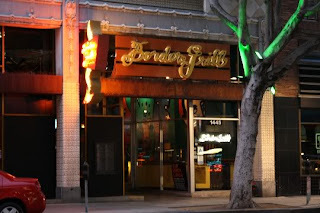 For dinner, we had a "cantina party" at Border Grill in Santa Monica. 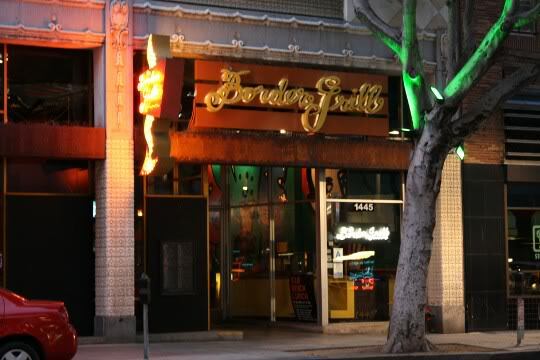 Border Grill is owned by two trailblazing female chefs, Mary Sue Milliken and Susan Feniger, the "Too Hot Tamales" of old-school Food Network fame, and more recently of "Top Chef Masters." I remember watching their Food Network show after school as a teenager and I loved how passionate they were about cooking authentic, gourmet Mexican food. I was really excited to finally visit Border Grill as it has always been on my "to-do" list of restaurants. Since we had a large group, I planned a set menu of appetizers and taco platters, and we had a drink package which included bottomless margaritas, sangria, beer and wine. 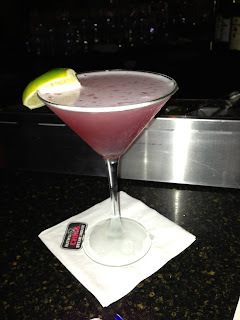 I tried two different margaritas, the classic and the "skinny." I found them both to be too sweet and sadly not very strong. 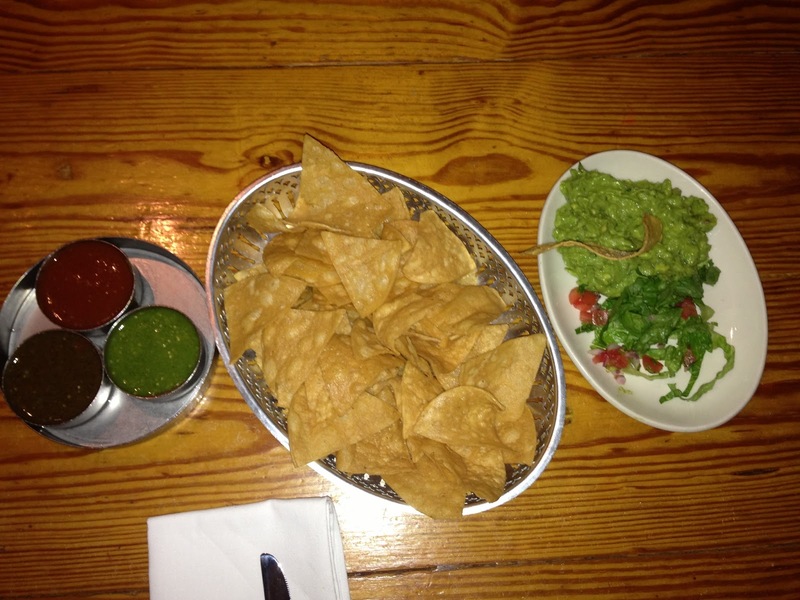 We started out with chips, salsa and guacamole. The chips were very fresh and not too thick or thin. They held up well to the rich guacamole, which was great though a little too much lime flavor for my taste. We had a sampling of three salsas: tomatillo, smoky chipotle and arbol. All three were excellent but my favorite was the tomatillo. I love combining tomatillo salsa and guacamole on top of a chip in one bite. The tanginess of the tomatillos perfectly complements the creamy avocado. 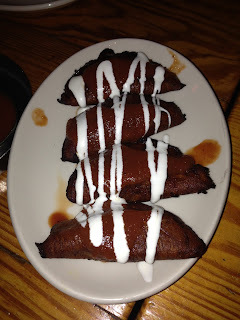 In addition to the guacamole, we had two other appetizers for the table: Plaintain Empanadas and Green Corn Tamales. The empanadas were very hearty - filled with roasted plantain, black beans, poblano chiles and cotija cheese, a crumbly, tangy white cheese similar to a Greek feta. They were topped with a smoky chiptole sauce and drizzled with crema. Very delicious but quite heavy. You would not want to fill up too much on these! 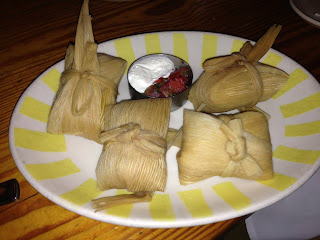 The Green Corn Tamales were delicious, but they were so sweet I would have preferred to have them for dessert. The tamale filling was basically a very sweet version of creamed corn. For our taco platters, we had Ensenada-style fish tacos, al pastor (pork, chicken and grilled pineapple) and carne asada. 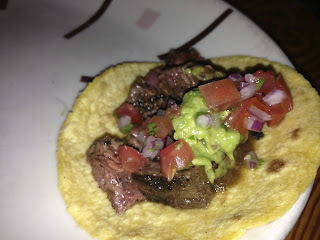 The overall favorite of our group was definitely the carne asada - grilled steak, caramelized onions, salsa and guacamole. The steak was so flavorful and cooked perfectly, and paired very well with the salsa and guacamole. The corn tortillas were also excellent - hearty enough to hold up to the filling with great corn flavor. 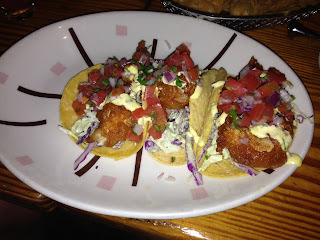 My second favorite was the fish taco, which was a large portion of beer-battered sustainable white fish (I forgot to ask what they used that evening), avocado crema and salsa. The fish was crispy on the outside and moist on the inside, but slightly oily since it was deep fried. A solid Baja-style fish taco. I also enjoyed the al pastor, which was a combination of marinated, slow-cooked pork, chicken and grilled pineapple. 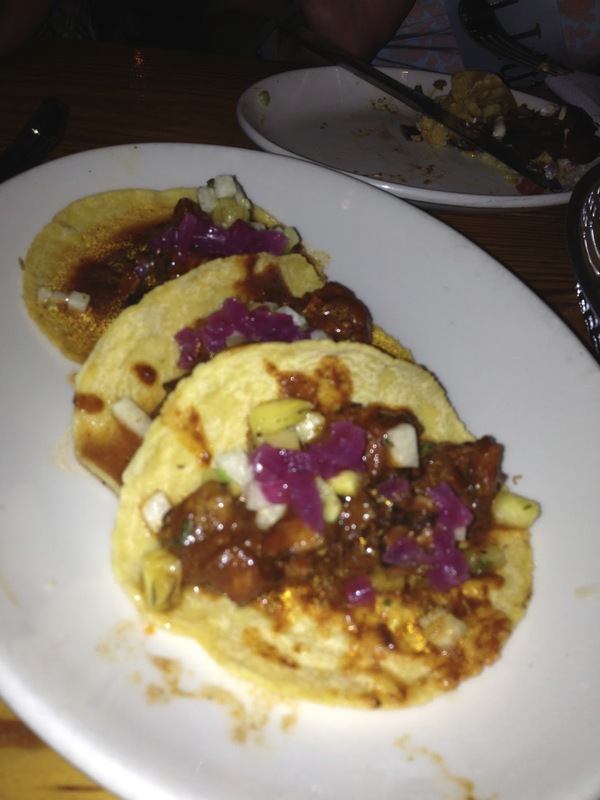 The tacos were topped off with pickled onions, which I love, jicama orange salsa and habanero. This was the most complex of the tacos, smoky, sweet and tart. 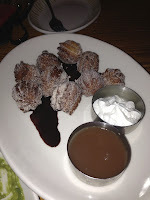 Our dinner package came with churro tots for dessert - donut-hole size pieces of the classic Mexican fried dough rolled in cinnamon sugar. These were pretty good, though slightly too doughy on the inside. They came with whipped cream and caramel sauce for dipping. The caramel sauce was very watery and lacking in flavor. 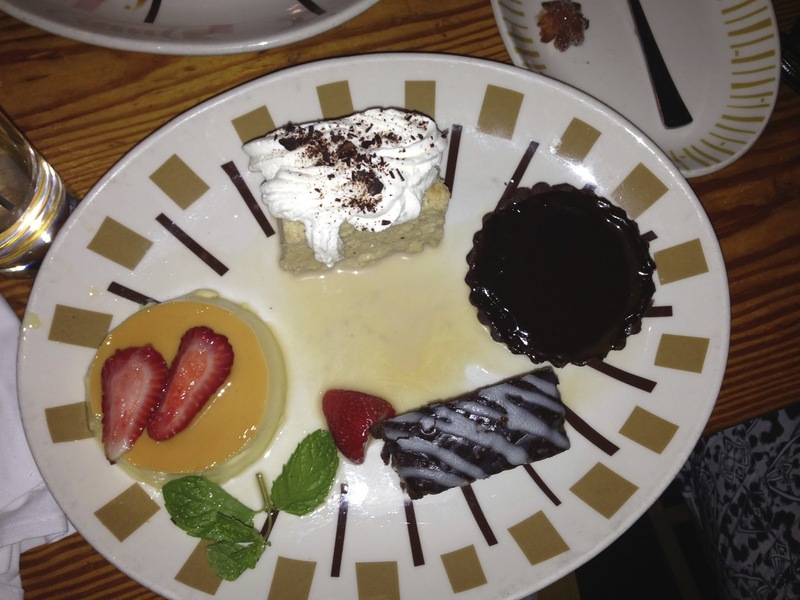 Because there was a slight mishap in our seating arrangements at the beginning of the evening, the manager was nice enough to bring us a dessert sampler for the table. This included flan, the traditional Mexican custard, made with goat's milk, espresso tres leches cake, a caramel chocolate tart, and a brownie with nuts. I've never been a huge fan of flan, but this was a very good version of it. The tres leches was excellent, incredibly moist sponge cake soaked in "three milks" (evaporated, sweetened condensed and heavy cream), the caramel chocolate tart was sticky and very sweet, and the brownie was a bit dense. Overall a decent sampling of desserts. Unfortunately we were so full after all of the tacos that we did not have much room for dessert! All in all, we had a great experience at Border Grill. The atmosphere is very lively, the service was excellent and the food was authentic and delicious. It is a good place to go for a casual lunch or dinner or a special occasion with a large group. They also have restaurants in Downtown Los Angeles and Las Vegas (in Mandalay Bay), and a food truck in Los Angeles.